It’s a dark day in Minnesota, but a bright future is on the horizon. Tuesday’s trade of ace Johan Santana to the Mets for outfielder Carlos Gomez and pitchers Phil Humber, Kevin Mulvey and Deolis Guerra is being viewed as drastically lopsided right now, but let’s not forget the Frank Viola, Chuck Knoblauch and AJ Pierzynski trades all looked one-sided at the time as well. I’ve written plenty about Johan Santana this winter and I’ve spent way too much time dreaming up improbable scenarios where he re-signed with the Twins and led them to multiple World Series titles. The simple fact of the matter is that one pitcher cannot and will not win his team the World Series. A stellar ace is always a plus, but he can’t pitch every game, thus why the Twins ultimately will benefit the most from this trade. Any time you gain four players with high ceilings and limited miles on the tires, it’s a positive thing. Here’s a look at what the Twins are getting out of the deal. 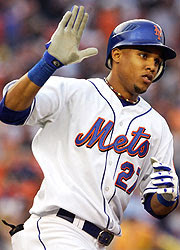 Carlos Gomez, OF: The most Major League-ready of the pack, Gomez retained rookie status in 2007 because of a broken bone in his left hand in July, which sidelined him for two months after he made his Major League debut in May. At 21, he was the youngest player in the National League at the time. Before his call-up, Gomez had been somewhat overlooked when discussing Mets outfield prospects because of all the talk surrounding teenage sensation Fernando Martinez. But Gomez had cruised through the organization, skipping from Class A Hagerstown in 2005 to Double-A Binghamton in 2006, showing no apparent need for some time at Advanced A. He hit .281 with 41 steals in the Eastern League at age 20. He has all the tools you look for in a premier outfielder, with the speed for center and the arm for right. He was hitting .286 at Triple-A New Orleans with 17 steals before his spring promotion, and then batted .232 with 12 more swipes in 125 at-bats with the Mets before his injury. The Twins’ current outfield mix features Michael Cuddyer, newly acquired Delmon Young, Jason Kubel and veteran Craig Monroe battling for corner spots and Jason Pridie and Denard Span in the mix for the opening in centerfield. Look for Gomez to charge right into that pack to make a claim for one of the spots, most likely centerfield. Philip Humber, RHP: With a strong spring, Humber could factor into the wide-open, but still competitive, battle for a Twins rotation spot. Drafted out of Rice University with the third-overall pick in 2004 and signed for a $3 million bonus, his pro career got off to a sluggish start as he posted a 4.99 ERA at Class A Advanced St. Lucie in 2005 before undergoing Tommy John surgery in July. He’s yet to really come back in pre-surgery form, but his trademark curveball is still a plus pitch. He spent most of ’07 in New Orleans, where he was 11-9 with a 4.27 ERA in 25 starts, striking out 120 batters in 139 innings. He finished the summer with three games in New York, posting a 7.71 ERA in seven innings. He is no longer the untouchable can’t-miss prospect he was when he signed in ’04, but at 25 years old and now two years removed from his surgery, 2008 could be a big one for him. Kevin Mulvey, RHP: Though his name is not generally mentioned in the same breath as the elite pitching prospects in the Mets system (Guerra, Humber and Mike Pelfrey), Mulvey is no slouch either. 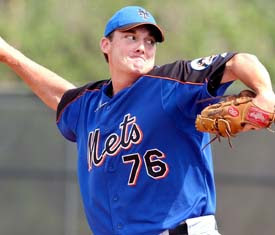 Drafted out of Villanova in the second round with the Mets’ first pick in 2006, he appeared in just a handful of games that summer before earning the organization’s Minor League Pitcher of the Year honors in 2007. A Futures Game selection and Eastern League All-Star, the 22-year-old went 11-10 with a 3.32 ERA at Double-A Binghamton before finishing his season with one scoreless start at Triple-A New Orleans. Without one dominating pitch, he mixes four solid offerings highlighted by his slider with good control. He is likely to begin 2008 at Triple-A Rochester and a strong first half could keep his name on people’s lips should the need for a starter arise. Deolis Guerra, RHP: The 6-foot-5 Venezuelan prospect, who won’t turn 19 until April, ranked just behind the apparently untouchable outfielder Fernando Martinez when it comes to Mets prospects, but he is likely to be the last to arrive in Minnesota. When he gets there, however, it should be for good. 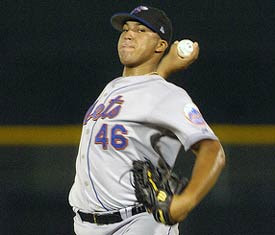 Guerra made his pro debut in stellar style in 2006 when, at age 17, he posted a 2.20 ERA at Class A Hagerstown, limiting South Atlantic League hitters to a .208 average. In ’07, still at 17, he was the Opening Day starter for Class A Advanced St. Lucie and pitched in the Futures Game as well. He battled some shoulder tendonitis, which limited his innings, but posted a 4.01 ERA in 90 innings in the Florida State League with a fastball in the low-to-mid 90s and a plus changeup, which ranked as the best in the Mets’ system. He continues to work on improving his curveball and refining his overall game. While he could start the season at Double-A New Britain, it is more likely that the Twins will opt to keep him back in warmer climate of Fort Myers, Fla., before sending him to the Eastern League later in the summer. …at this point it’s too soon to tell who will ultimately get the better end of this trade. Twins fans have lost a lot of fan favorites this off-season and the loss of Santana only further amplifies the direction the team appears headed in the near future, however, the trade does leave the fans with hope that within a few years time the Twins could be contenders again.